Olustvere manorial estate complex with its numerous buildings and park with many species is situated in the heart of Olustvere. The manor was founded in the second half on the 16th century. At the end of the 18th century the manor came into the possession of the Fersens – an ancient noble family from Norhtern Germany. The manor stayed in their possession until its expropriation by the Republic of Estonia in 1918. 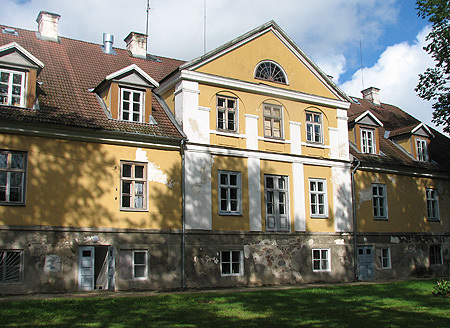 Olustvere is one of the best preserved manorial estate ensembles in Estonia. Entering the manor park from between the stone walls, the noble heimat-style manor house is first to catch the eye. With its bright colours it fits well into the greenery of the surrounding park. The old manor house, estate manager`s house, granary, drying hose of massive stones, distillery, stables and cattle-sheds and several other houses have also preserved. The surrounding park covers an area of 20 ha. It was founded in the English style and is characterized by well-matching groups of trees and bushes, winding paths, beautiful pands and spacious lawns. The oldest tree in the park is a 300-year old two-branched oak, what is called “the oak of love”. The famous Olustvere maple, oak, linden and ash tree avenues that total 10 kilometres also start in the park. Olustvere has long traditions in the teaching of agriculture. It began in 1914 when the Estonian Alexander Lower Agricultural School was founded in Kõo manor and was transferred to Olustvere in 1920. This oldest Estonian school of agricultural education has existed under different names until today. Today the school is named as Olustvere Service and Agricultural School, what teaches agriculture, catering, tourism and secretary management. 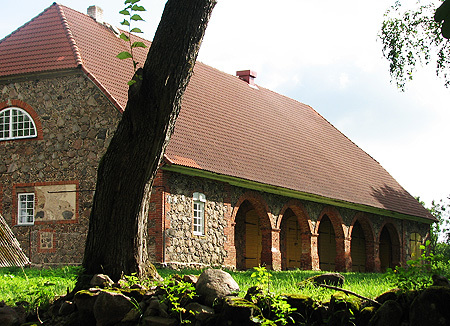 Museum of the Kapp family was established in 1973 as a branch of Viljandi Museum. The museum is in a building constructed by Hans Kapp in 1926–1929 that became the home of Villem Kapp in 1938. The building was largely reconstructed in 1973 and a memorial plaque commemorating Villem Kapp was put on the building’s wall. The museum is on the ground floor. There are an exhibition room, a main hall, a bedroom, and a dining room, later redecorated as a music room. Most of the displayed furniture belonged to Hans Kapp, a part of it to Joosep Kapp. Villem Kapp composed most of his music on the piano displayed in the main hall. In the music room opened in 1998, there is a grand piano which belonged to Eugen Kapp. The first Estonian born painter and professor Johann Köler was born in that farmhouse. The museum is collecting materials related to Köler; a farm complex dating back to the second half of the 19th century is being restored. There is a big swing in the farm-yard, near there are places of campfire and camping, and a board with the information about hiking paths on it. At Hüpassaare, there was the father’s farmstead of the composer Mart Saar (1882–1963). After the death of the composer, a museum was established at Hüpassaare to introduce the life and creative heritage of the famous Estonian choir-musician. Mart Saar composed most of his music there in the middle of forests and mires. An organ, what was a present for the musician’s 8th birthday, is displayed together with other things. An open-air stage is near the home museum. It is a place where many music events of Viljandi County are held. A hiking path to Soomaa National Park to the bog of Kuresoo starts near the museum. A part of the Soomaa National Park is situated on the territory of Suure-Jaani municipality. Soomaa National Park was founded in 1993 to protect untouched unique wetlands, mires, floodplain meadows and forests. The national park has become popular due to its five seasons, diverse natural features and unique cultural characteristics like archaic flat-bottomed boats made from single trunks of trees, (the dugout, called haabja) and suspension bridges. In Soomaa Visitors Centre at Kõrtsi -Tõramaa, there is an exposition and introducing computer programmes for the visitors, information on hiking trails, picnic places, etc is available. The most popular are Ruunaraipe trail, Beaver trail (Kopra rada), Riisa swamps, Mulgi meadow, Oksa complex, Latvian seeing-tower, Meiekose study trail and a camping place, Ingatsi trail, seeing-tower and bridges, Karuskose Hiking Centre, Saarisoo Canoeing Centre. The Church of Great Saint John the Baptist was built as a Gothic style fort-church in 1330s. It is a typical Central-Estonian church with three naves. There is a rectangular east choir and tetragonal west tower. The portals of the church are remarkable. The west portal has a round window above it, the north portal has stepped profile. During the wars the pillars and arches of the church were destroyed. Supposedly, the church had round pillars. The wooden ceilings were built when the church was reconstructed. Late baroque organ prospect (by Johann Andreas Stein, 1804) covers the organ made by the Kriisa brothers in 1937. The altar wall dates back to 1870 and was created by Johann Gottfried Mühlenhausen. The altar painting of church is „Jesus Christ on the Cross“. There is a monument of Hans Heinrich von Fersen, a memorial plaque for Alexander von Fersen, and a unique cross from 1598, one of the oldest in Estonia, in that church. The religious services of the Suure-Jaani Lutheran congregation are held in the church. The church is open for the visitors from 1 June to 2 September every day from 12.00 – 18.00. There is the Lõhavere brook with picturesque mill lake on it in the centre of the mansion complex. The main buildings are surrounding the square in front of the manor house. A Special Boarding School of Lahmuse is working there now. Lembitu stronghold is located approximately two kilometers north-east of the town border of Suure-Jaani. The stonghold was the strongest centre of the Estonians‘ fight against the conquest of German Sword Brethren in the 13th century. The Estonian leader Lembitu elder of province lived there. Not much except the high hill remains of it. There is also a monument commemorating the ancient fight for freedom, opened on 21 September (on Madise Day) in 1969 at Linnamägi. The monument is made from red granite blocks. On the two sides of the blocks, there is a part of the text from the Chronicles of Latvian Hendrik in Latin and Estonian. The authors of the monument are the architect Ülo Stöör and the sculptor Renaldo Veeber. The monument commemorate those killed in the War of Independence was erected on 26 June 1926. The money for it came from fund-raising activities and donations. The author of the monument was the sculptor Amandus Adamson. The elder of Sakala province Lembitu, wounded but still holding high his sword, was depicted there. At first, it was also designed to engrave the names of 75 citizens of Suure-Jaani killed in the war on the plaques of the pedestal, but it was not completed. The monument was smashed in 1941. It was restored but demolished again in 1950. Meantime, the statue of Lembitu found its place in Viljandi museum. The monument was restored and re-opened on Midsummer Day in 1990. In 1840s, the religious movement took place in Suure-Jaani parish. The „Russian“ religion was introduced to Estonians. The Orthodox congregation of the Suure-Jaani was founded in 1847 and the cemetery in 1911. The Orthodox Church of Suure-Jaani built in 1906-1908, is an architectural and cultural heritage which is in bad condition right now. Only the red brick walls are indicating the former magnificence, the roof and towers need urgently to be restored. The lake of Suure-Jaani together with a park rich in species on shore of it, initiated in 1930s by the local headmaster, form a picturesque complex. The lake was cleaned in 1993. There is an open-air stage of Suure-Jaani and a music pavilion. A beautiful view with the church of Suure-Jaani opens over the lake. Three times a year – in winter, spring and summer, fishing competitions are arranged on the lake by the fishing club „Suure-Jaani Säga“. Very popular lake parties with numerous visitors are held on the shore of the lake. In 2010, it was already the 50th party which was organized by the Suure-Jaani Kultuurimaja (Suure-Jaani Culture Center). The cemetery is rich in tombs of the famous persons of Estonian cultural heritage. There are the graves of the painter Köler, musicians and composers Joosep, Hans, Artur and Villem Kapp, Mart Saar, Julius Vaks, the actor Aleksander Mälton, the first professional agronomist in Estonia Ado Johanson. Also the Fersen Earls and the clergymen of Suure-Jaani are buried there.